Catering specifically for thinning hair, the Serioxyl Denser Hair Gelée from L'Oréal Professionnel works to leave strands looking fuller and thicker. 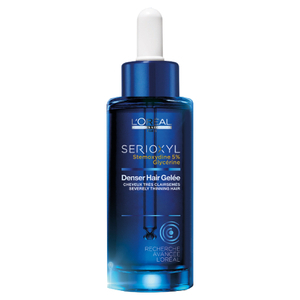 Harnessing the powers of Glycerin and 5% Stemoxydine™, the daily serum delivers long-lasting hydration to the scalp; helping to create an optimal environment for healthy hair growth, whilst strengthening and increasing density of hair. Complete with a convenient pipette for mess-free application.